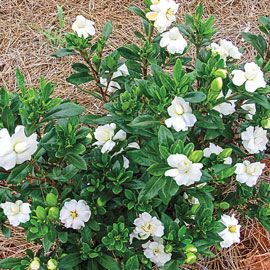 Double Mint Gardenia | Henry Field's Seed & Nursery Co.
Spellbinding fragrance from May through fall. Double Mint Gardenia has an exceedingly fragrant, romantic aroma. Plant near a pathway and prepare for Double Mint's perfume like fragrance to cast a spell on your spouse! Starts blooming in late May and reblooms throughout the summer into fall. 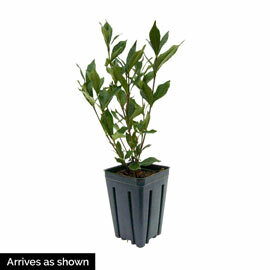 Compact foliage is 3–4' tall at maturity. Potted. Zones 7–9. Light Requirements They are best planted in light to partial shade; preferably with morning sun and afternoon shade. Depth: Plant at the same depth as in the pot it is shipped in. Sun/Shade: They are best planted in light to partial shade; preferably with morning sun and afternoon shade. Blooms: Starts blooming in late May and reblooms throughout the summer into fall. Pruning: Remove darkened blossoms to promote new buds, and prune after the bush is finished flowering in the late fall.